MANILA, Philippines - Some of the local government units (LGUs) announced class suspensions for tomorrow, Saturday, August 13, 2016 due to heavy rains brought about by the Southwest Monsoon or Habagat affecting Luzon, Metro Manila and Visayas. At 4:00 p.m. today, state weather bureau PAGASA said low pressure area (LPA) was estimated based on all available data at 205 km north of Itbayat, Batanes (22.6ºN, 121.5ºE). PAGASA added forecasted that the monsoon rains which may trigger flashfloods and landslides will be experienced over the provinces of Zambales, Bataan, Pangasinan, Mindoro, Palawan, Cavite and Batangas. "Cloudy skies with light to moderate rains and thunderstorms will prevail over Metro Manila, Western Visayas and the rest of Luzon. Partly cloudy to cloudy skies with isolated rainshowers or thunderstorms is expected over the rest of the country," the weather central said. Here's a guideline on automatic class suspension. 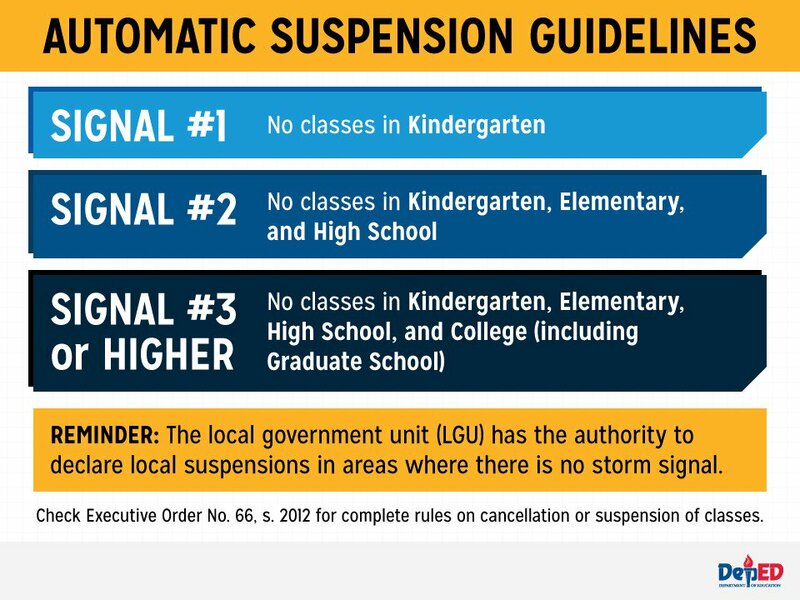 Note: LGUs have the authority to declare local suspensions in areas where there is no storm signal.